There's nothing crude about this raw cuisine. Now the vibrant, fresh flavor and abundant nutritional benefits of raw cuisine are available to anyone, any way you live! Practically Raw’s revolutionary practicality and flexible approach let you enjoy Chef Amber’s delicious vegan dishes your own way, according to your budget and taste, every day or every once in a while, and as raw — or cooked — as you like. 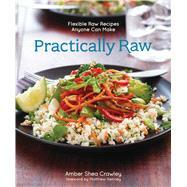 Certified raw chef Amber Shea has designed these recipes to be made with ordinary equipment and ingredients, and with the flexibility of many substitutions, cooking options, and variations. Ideal for beginners as well as seasoned raw foodists, Practically Raw has something for everybody, whether you want to improve your health and longevity, cope with food sensitivities, or simply eat fresher, cleaner, and better!